Upfront and personal: I am not a quitter. I will gamely finish the less-than-savory pasta I paid for at the overrated restaurant, keep eating salad until the last of the holiday pounds melt away, and keep grading essays until my eyeballs roll around to the back of my head. I stick to it. Just so you know. That being said. I am struggling with my reading habits these days. I used to stick with a book, even if it took me days and weeks to soldier on, I would finish it, gritting teeth if necessary (Henry James’ The Portrait of a Lady comes to mind). Lately, I give a book approximately five chapters, roughly a hundred pages, before I judge and jury it back into the library bag for prompt return. My dilemma is this: Would a true Book Booster succumb to TAB Syndrome? Is it acceptable that I wontly and willingly set aside a chosen read and it becomes The Abandoned Book? I have dismissed the following books in the last couple of months. 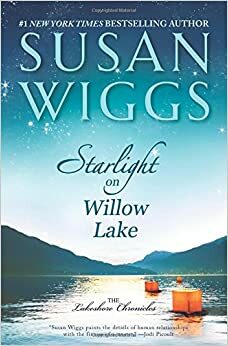 Starlight on Willow Lake by Susan Wiggs. My mom recommended this author. Often. Frequently. *sigh* Trying to be the good daughter, I gave it go. Mom and I have different tastes in reading. I toss out titles to her. She tries them and politely responds how the book didn’t quite work for her. This time she tossed out an author to me. Apparently Susan Wiggs is a popular, best selling author of over 35 books. I had no idea. A whole shelf is dedicated to her novels at our library, or at least ones that haven’t been checked out. This particular plot focuses on a mother embittered by life since she is now a quadriplegic from a skiing accident that also killed her husband. Her three children are all successful and have aptly provided for her–she is at odds with the oldest son who would rather send a check than visit with mumsy. Mums burns through caretakers like bees flit through a garden. This is where the underdog caretaker is hired. There is also the cold, yet efficient assistant/fiancee to said distant son. I knew where this was going after I read the blurb. I would have hung in there, as I don’t mind the romantic trope of jerk-son-gets-bested-and-turned-around-by-single-mother-with-a-heart-of-gold-who-has- two-extremely-needy-daughters plot. I’m not terribly prudish, yet when everyone starting dropping profanity as if the educated 10% do so because it must be oh-so-cool, I thought “Five chapters–I’m out of here.” Sorry, Mom. Next up was an AP recommended author I’ve been putting off reading because his writing style is so Joycian. I don’t mind creativity, but I do like commas and other regular punctuation. Emily D is an exception–dash it all, I can handle her penchant for pause for something as short as her poetry. An entire novel of creative punctuation is too much for this English teacher. 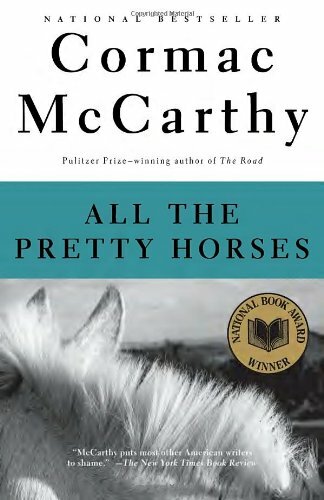 So I got Cormac McCarthy’s All the Pretty Horses as an audio book. If I can’t see the punctuation misdemeanors I can simply focus on the story. Wrong. I really like John Grady Cole. He reminds me a bit of a young Paul Newman in his cool, calm and collected approach to life. I even tolerated Lacey’s potty mouth because his colorful vernacular was such a part of who is. He probably couldn’t talk if a swear word wasn’t in there. Plus, the audio book reader was talented at creating distinctive characters. I hung with Horses until John Grady and Lacey get hired at the Mexican ranch. As soon as the boss’s daughter arrives on the scene I couldn’t bear the heartache of watching John go down as he fell for her. I became too attached. Maybe I’ll watch the movie. I can always fast forward Matt Damon’s pain. A student wanted to do David Mitchell’s Cloud Atlas for his Author Spotlight and I try to check out what my students are reading. I tried to get involved in the book, the premise sounds fascinating; however, I couldn’t get past the guy sifting the rocks for cannibal teeth so he could make dentures for a high society lady and then tell her that she was chewing with said teeth. Too gruesome for me. I might give it go sometime, someday because the switched storyline style intrigues me. There is also the movie. I have abandoned other books. Not often, but I do. I don’t feel this guilt out ejecting a movie from the DVD player. Somehow setting aside a book is like walking away from a conversation. It feels rather rude. I’m working on casting off this guilt. There are, after all, so many other conversations waiting for me out there. Anyone else struggle with TAB Syndrome? Being a gregarious hermit means I have moments of friendly banter mixed with overpowering needs to keep myself to myself. This is why I hide behind my plumey of Cricket Muse. I chirp when in the mood, and spend the rest of the time ensconced thoughtfully in my little world of teaching, reading, and writing. I have played around with what my pen name should actually be. So far I’ve been published under three. The Chicken Soup people wouldn’t let me publish my essay on “Piece of Quiet” as Cricket Muse–too, umm, cute. They did relinquish under my compromise of C. Muse. Friends and family responded with “why”? As in why not use my real name. I guess I could have used my own name, but where’s the mystery in that? I am in good company. Look at these wonderful authors and their real names. See–it worked for them. Here: give it spin and see what you come up with…and do share it you get a doozer. 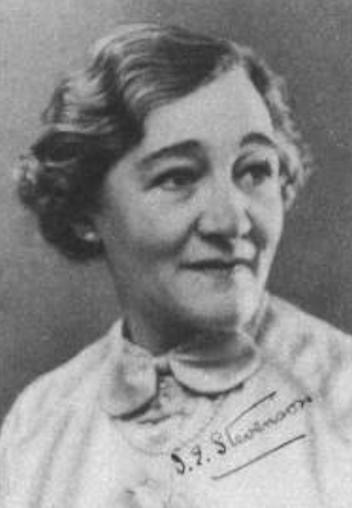 Dorothy Emily Stevenson was a related to THE Robert Louis Stevenson. Educated by a governess and denied college because her father didn’t want an educated woman in the family. She published nearly fifty books in her career. At the height of her career, her books sold in the millions internationally. A granddaughter discovered a couple of manuscripts in the attic in 2011 and they were immediately snapped up and published. Being Scottish, most of her plots center around Scotland and England, with WWI and WWII’s affect on its people often being a main theme. Her books gave clear insights into the lives of those who called the countryside their home. Adept at characterization, her books often overflowed and intermingled with one another. Died in 1973, yet beginning in 2009, her books are slowing being reissued. Members of Stevenson’s family are amazed by her enduring popularity. Her daughter, Rosemary Swallow, remembers how her mother worked. “She would sit down on the sofa, put her legs up and light a cigarette,” she said. “She had a special writing board, a wooden board covered in green baize and she would just carry on writing whatever was going on around her. I discovered her books about twenty years ago when working at a public library. A friend and co-worker knew I preferred “gentle” reads and suggested Stevenson. I read everything the library owned, and even ventured into the scary overflow storage basement to retrieve forgotten copies. Currently I’m on a mission to read all her titles. The writing is solid, with its intriguing plots involving mysteries, light romance, and brilliant characterization. When I’m feeling a bit lost due to stress from a long week, I find myself again by reading a Stevenson novel. One reason I read books is because I dread ever so much to travel. I do like the “here I am” of arriving. It’s all that packing, squishing into miniscule airline seats, fretting about schedules, realizing I brought the entirely wrong things to wear, that make traveling drearisome. I do like the exploring, discovering, reveling that is part of going somewhere new. This is a big reason why I read novels. Reading, especially fiction, takes me places that doesn’t involve packing a bag. This month’s Writerly Wisdom set of quotes focuses on that aspect of writing involving place: setting. How does a writer put me in the “there” of their writing? How important is setting for you when reading? Is it more important than visualizing the character? What memorable settings have you discovered in reading–which authors are able to transport you to that place in the writing? Sometimes a novel is similar to a wave in how its impact builds momentum, breaks, recedes, and begins the cycle all over again. The Giver by Lois Lowry is such a book. First published in 1993 it pushed societal paradigms, gathered a following, and is once again building another following due to the film adaptation. It’s still considered controversial some twenty years later. The story is deceptively simple, yet profound in its impact. There are so many issues presented: government control, euthanasia, loss of innocence, and dystopia versus utopia. Lowry presents these heavy issues with a light hand and leaves reader with hope in its ambiguous ending. It deservedly won the prestigious Newberry Award. For many years The Giver remained a standalone title. And then Gathering Blue came out in 2000; however, it wasn’t a true continuation of The Giver and frustrated many readers looking for answers, because it teased a bit, alluding only slightly to Jonas’s world. Readers had to wait until 2004 for Messenger, which served as a bridge between The Giver and Gathering Blue. Alas, answers still weren’t totally available and finally in 2012 closure arrived with Son. Having read The Giver when it first came out, I was impressed with its message, although a bit dissatisfied with its ambiguity at the end. “That’s it?! ?” I felt like shaking the book to see if I could render out the last drop, maybe find the missing resolution or at least find a denouement of sorts. I wasn’t aware of the succeeding books that formed the quartet and had the distinctive pleasure of reading the quartet in succession after watching the 2014 film adaptation of The Giver. 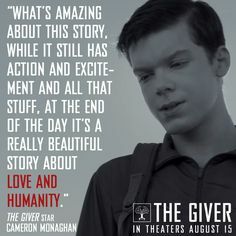 Due to the sizable waiting list for The Giver (could it be the movie stirred people to seek out the original?) I began reading the other three and saved The Giver for last. Glad I did so, because the library (love my library) bought the newest edition, which is a twenty year celebration of the novel, and it contains an introduction, a reflection, by Lois Lowry. Her humor and unique outlook is prevalent and added a dimension to the reading I wouldn’t have probably gained reading the standard paperback issue. A bonus section (special features?) included interviews of different actors from the movie including Taylor Swift. Lowry is one of those authors who provides the reason why adults peruse the kids’ section when searching for a good read. I’m pretty sure I’ve expressed my appreciation for Jasper Fforde from time to time. He’s right up there with Douglas Adams in literary wit and as for style? I’m not sure who comes close to his genre-tweaking way of getting his point across. Playful, knowledgeable, and quite entertaining. 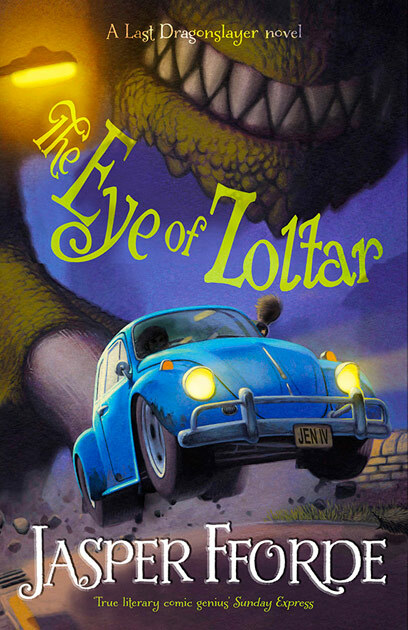 I was introduced to Jasper Fforde by a librarian who knew I taught Brit Lit. “You will definitely enjoy him.” Of course, with those words I felt a)obligated to try him out b)a bit hesitant–whenever someone tells me I will like something I inevitably don’t. Happens to you as well? Must be that human nature thing. The first in the series. I do adore Jane Eyre. I’m drawn to capable women protagonists. I relish clever wordplay. And I’m hoping Thursday Next will become a series. I didn’t care as much for the Nursery Grimes series. I also felt Mother Goose a bit grisly for my tastes, same for Grimm fairy tales. I waited for another Fforde to interest me. After reassurances, accompanied by a quick summary, my son’s relief became evident when he learned the plot involved dystopian ideology based on quirkiness. He understood it to be my kind of book after all. 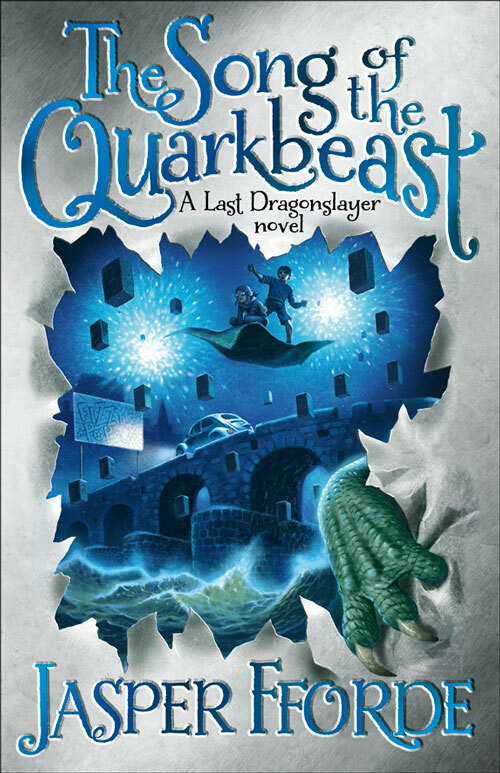 While fretfully awaiting the next in the series, Fforde pulls a fast one and comes out with another series The Last of the Dragonslayers. Although aimed at YA readers, I’m thinking it is really Thursday Next vacationing as a sixteen year old foundling who is coping with dysfunctional magicians. 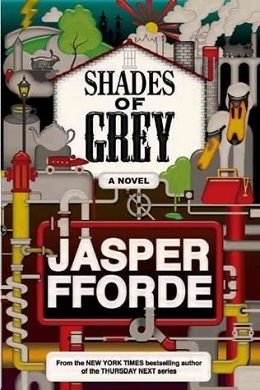 If you haven’t come across Jasper Fforde and you do appreciate a writer who wittily pokes fun at politics, literature, and popular culture, you might want to try one of his series. Plus, it’s difficult to resist a writer who appreciates Volkswagen Beetles like I do. They are the car of choice. I came soooo close to spending my inheritance check on a bright red convertible Bug. Caving into family concerns who convinced me into buying something more sensible (I don’t regret my choice of buying a Honda Civic) I now live vicariously through heroines who drive VW Bugs as they dash about taxiing futzy magicians to and fro. It is always exciting to discover a new-to-me author. In this case it’s Kazuo Ishiguro. I know, I know. I’m a bit late in my discovering; however, better late than never in finding an author of mesmerizing style. I knew the movie Remains of the Day, before finding the novel and didn’t realize the movie was the adaptation. How could I possibly pass up a film starring Anthony Hopkins and Emma Thompson? Flash forward five years later and I’m perusing the AP Literature list (“read that one, will never read this one, not reading this one again”), when I recognized the title Remains of the Day and connected it to the movie. 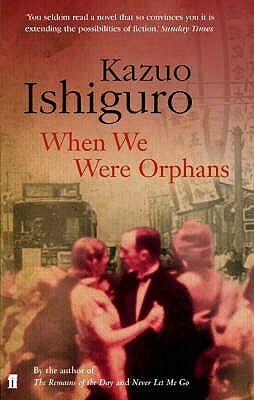 Then I read the author’s name and I must admit I expected something like Adrian Smythe or Winston Greene, not Kazuo Ishiguro. After all, the novel is about a very proper English butler and his reflections of what it takes to become the best of English butlers. Wouldn’t one need to be English to understand that sort of nationalistic pride? I’m not getting points here for narrow-minded thinking, am I? It turns out Ishiguro is quite well-suited to the task of writing about the English since he moved to England when he was around six years old. This gives him the ability to have an insider’s view with a somewhat detached perspective. The result is basically a stream-of-consciousness narrative concerning the tunnel vision of a man’s quest for the unattainable. Trying to live a life that is beyond reproach, to achieve a status of perfection, requires sacrifice. Can sacrifice be made without regret? This is the hidden truth Stevens, the butler is searching for, except he does not realize it. A quest novel of notice did not go unnoticed, for Ishiguro’s debut garnered him the Man Booker Prize and set a bar. Would he be a one shot wonder or would this be the first work of a noteworthy word smith? 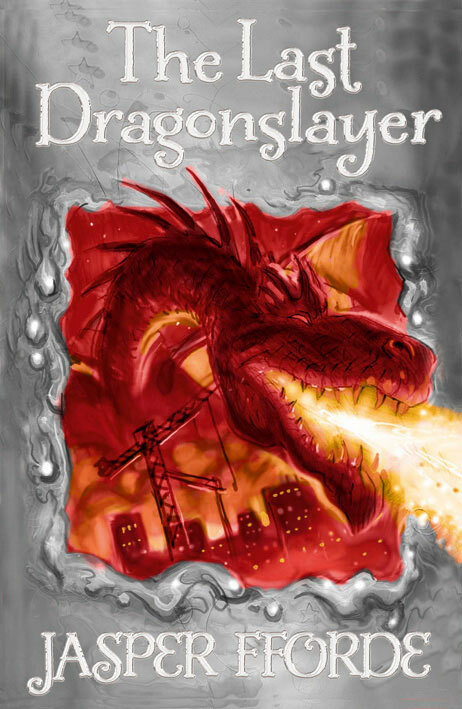 image: goodreads.com This cover indicates the layers found within the story. My literary taste buds curious for more, I trotted down to the library. Grabbing any title of his that caught my eye on the shelf, I opened up his fifth novel When We Were Orphans. I immersed myself in reading it to the point the MEPA queried, “Still a good book?” Yes, thank you. Prognosis? After reading two novels, indications are Ishiguro is wordsmithing wonder. Two novels have been adapted to the screen, Remains of the Day, and the more recent Never Let Me Go. Both have been received well, considering Ishiguro’s stories are mainly first person narratives, making them difficult to translate into a cinematic plot. His novels are historical in nature, with attention to detail. The stylistic viewpoint is that of the unreliable first-person narrator, one who is flawed in outlook. Although born in Japan, he did not return until thirty years later. The Times ranked him 32 on the list of the 50 most influential British writers since 1945. I plan on continuing my course of exploring Ishiguro’s work and look forward to introducing a contemporary author to my APters, who, I’m sure, would like a break from dead white folk now and then. Any thoughts on Ishiguro’s writing? Any suggestions for the next title I should read of his? George, too familiar with his Patton role, brought it to his interpretation of Rochester. He railed and ranted in a very American accent and I gave up after he meets with Jane after their encounter on the road. Besides York’s Jane being too old and much too pretty I couldn’t sit through the poor film quality. The video transfer was so muddied I felt as if I were watching the movie through an unwashed glass. 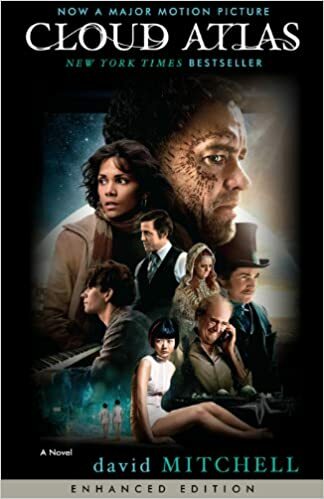 Being a BBC production, I had initial trust it would be a quality adaptation, after all these are the folk who brought us Colin Firth as Mister Darcy. The sets, the important scenes, those inscrutable nuances of the original story are all contained in this mini-series. Timothy Dalton definitely understands the Byronic hero that Rochester embodies and has even said in interviews Rochester is one of his best roles. 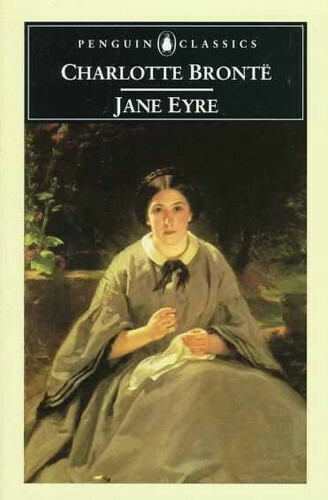 Clarke, while a bit older than the required 18 year old fresh from her Lowood imprisonment, captures the Quakerish passivity and ethereal nature of Jane Eyre. The scenes between Dalton and Clarke are melt-in-the-mouth truffle satisfying. Their version is what comes to mind most often when I return for a refresher novel read. I really did believe a heartstring developed between them. The agony of Dalton’s Rochester when he realized his Jane was leaving him forever kept the tissue box occupied. William Hurt seemed on the verge of understanding Rochester, but kept the bitterness too diminished, too washed out. Charlotte G as Jane got her part right. The plain, passionate young actress imbued the paradoxical spirit of Jane Eyre. 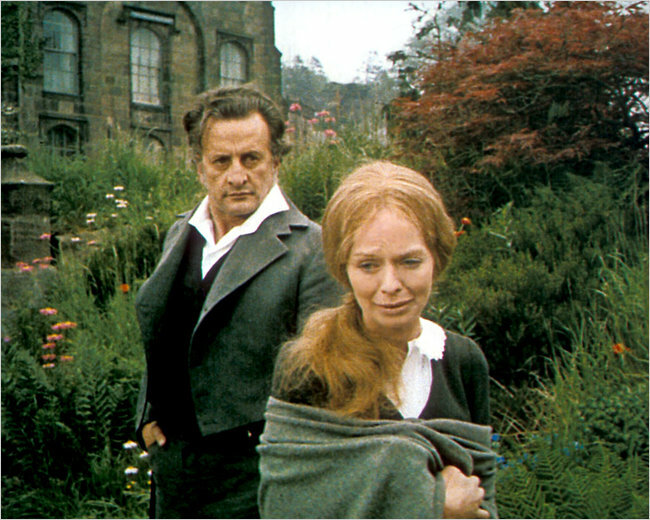 Sadly, there existed no believable passion, that needed kindred heart-string spark, between Gainsbourg’s Jane and Hurt’s Rochester. This spark is the very core of the novel. Without that essential core the movie floundered about like a fish hoping to get back into the water to have a proper swim. The director who brought us Romeo and Juliet, Taming of the Shrew, Hamlet, and other great stories of passion missed the mark with this adaptation by rushing the story and taking way too many liberties with the plot. Admittedly, I had started watching this version years ago when it first came out, but found myself so disenchanted with the cutaway flashbacks, I couldn’t get past the Lowood scenes and it wasn’t until recently I returned to another viewing. I did like the lead actors portrayals, and yes, there was a definite spark between them. I thought Toby Stephens got off easy with his fire wounds, unlike Hurt and Dalton. His rugged looks only appeared rather marred, instead of being ruined. The rolling around, ankle rubbing bit at the end seemed a bit too lenient for true Bronte style. Then again, there are leniences throughout this adaptation I willingly overlooked since the production quality proved so high. The first scene makes a diehard JE fan sit bolt upright and ask, “What? Wait–did the movie skip! because the opening scene is starting right off with Jane making her mad dash from Thornfield, which usually means the film is winding up to the grand finale. Instead Fukunaga gets a bit artsy and dips in and out of Jane’s childhood days in flashbacks, with a quick glance at times at her more recent history. Artfully done, but a bit disconcerting for those who prefer the linear progression. Fassbender and Waikowska do provide a sumptuous Rochester and Jane. Looks, mannerisms, nuances, smoldering passions–it’s all there. That’s why it the ending is so absolutely frustrating. I could not understand the need to transform Rochester into a Tom Hanks Castaway lookalike. Maybe trading out the maimed hand for a beard was a contract compromise. Also, there should have been another 20 minutes of wrap up, yet we are whisked away much too soon. It’s like being served the most savory dessert and having it taken away after a couple a bites–“Yo, I wasn’t finished.” Apparently Fukunaga thought the audience needed no more indulging and wanted us to move away from the table. Overall: If a dedicated JE fan go to one of the series adaptations, such as the 1983 or the 2006. It appears that only when given the proper amount of time (3-4 hours) can Jane’s story be told sufficiently. However, if thinking “book or movie first?” and movie wins out–get the 2011 version. Further notation: I thought about finding the Ciarin Hinds version, especially after watching him in Austen’s Persuasion with Amanda Root. Our library no longer has it and after reading the widely mixed reviews of loving it and hating it, I thought I will stick with my picks of 1983, 2011, and 2006 for classroom clips. Any readers have their own picks of fave JE adaptations? Since 2001, authors, illustrators and poets make presentations on the National Mall in various pavilions. In 2013 over a 100 authors represented Teens & Children, Fiction & Mystery, History & Biography, Contemporary Life, Poetry & Prose, Graphic Novels & Science Fiction and Special Programs. 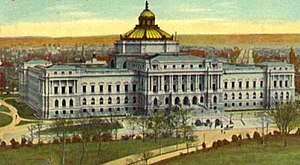 If a person has longing to know all about the Library of Congress, then a visit to their LOC Pavilion is in order. There is so much moAt the Library of Congress Pavilion than books. There is more bookish good stuff from the LOC. Want handy access to classic reads? Then you need to click on the Read.gov link and start enjoying a range of reading from the John Carter series to Aesop Fables and what lies in between. Are you a teacher, a parent? If books are an important part of your education input, you will want to perk up and take time to read the guidelines about the LOC contest Letters About Literature. Prizes too! I look forward to introducing this to my students. Stay tuned for more love notes about the nation’s library.